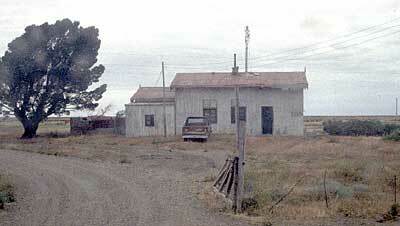 A recent photo of the town side of the Puerto Deseado station building, in December 2000. The ground floor is now a railway museum and café/pizza parlour, but the upper floors are empty. The opposite side, in May 2011, viewed from across the yard. Whilst most sidings have been removed, the main line and platform tracks were still just about complete in 2000, though some sections have since been removed..
And a close up view taken at the same time in December 2000. 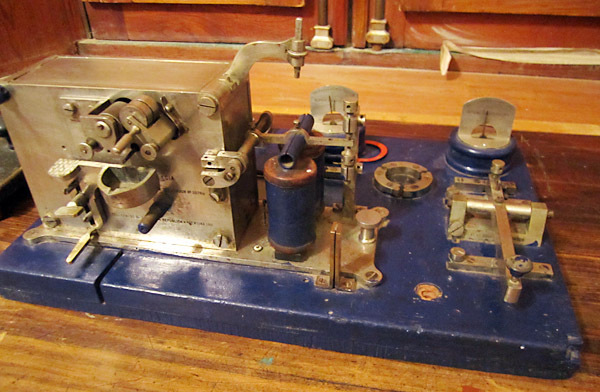 A telegraph tape machine is on display in the museum now housed in the old station building. 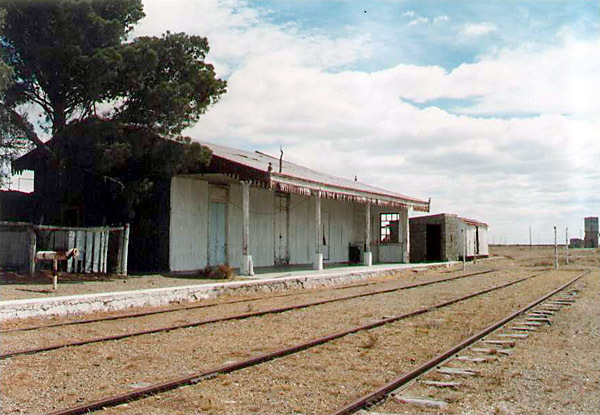 Puerto Deseado loco shed. The right hand road appears to have been sealed up professionally some time ago, but the left hand doorway has just been temporarily boarded up. 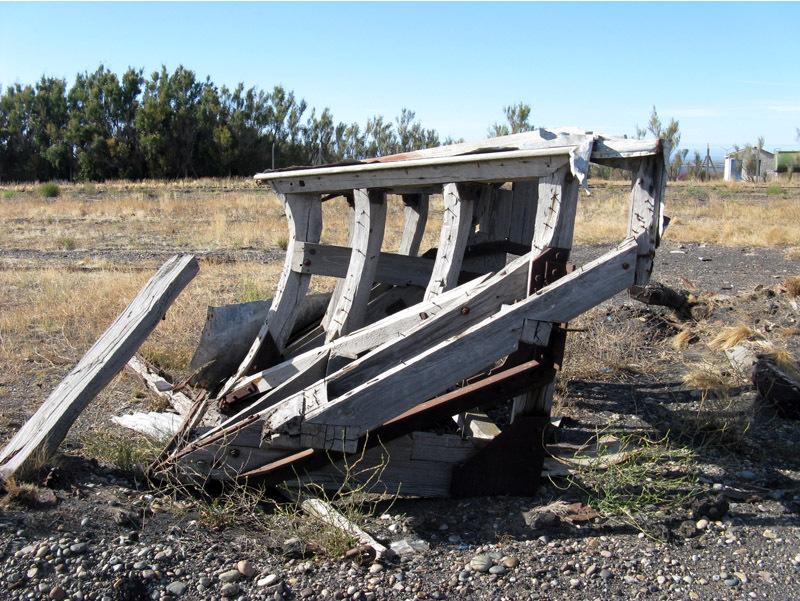 These are remains of a buffer beam mounted snow plough missing its sheeting. In order to mount it the usual cattle guard must have been removed before fitting the plough. This view is useful as it shows the structure of the plough which is usually hidden from view. The design of the PATAGÓNICOS tanks was unusual in that the tank itself provided the longitudinal strength. 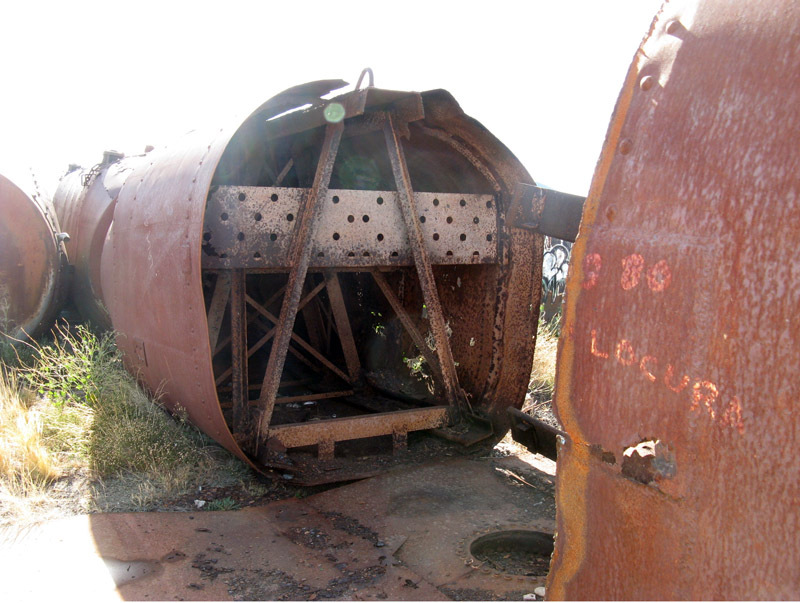 When the rolling stock was being broken up in the late 1970s, it was thought too dangerous to attempt to break up the PATOGONICOS tanks due to their being highly contaminated by (crude) oil – presumably as the demolition was being done aided by an oxy-acetylene burner. Accordingly they were just left so that today we may glimpse the elaborate internal framing which they had at one of the lifting points of the tank. 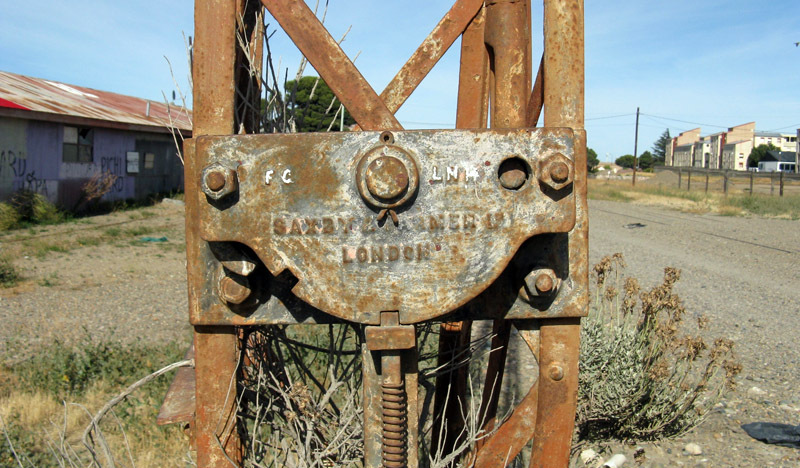 This casting at the base of a signal post not only shows the name of the maker – Messrs Saxby & Farmer of London, England – but also displays the initials FC LNH meaning Ferrocarril Lago Nahuel Huapi, ie. the name of the original intended distination up at Bariloche far to the north. 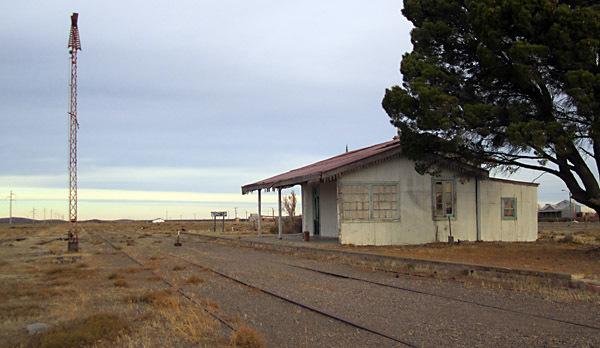 Tellier station in May 2011. This view illustrates the single signal with two arms that was used at many stations. 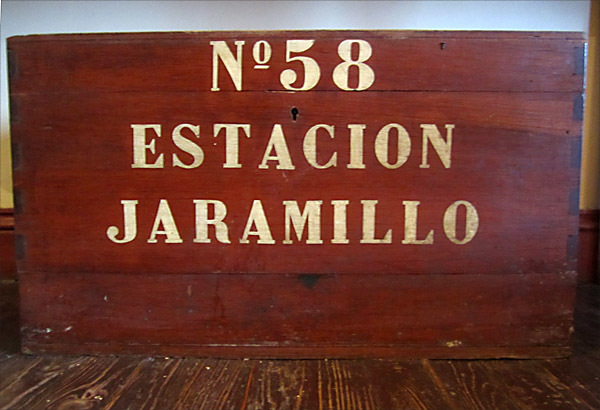 The first aid box from Jaramillo station, as now preserved in the museum in Puerto Deseado station building. 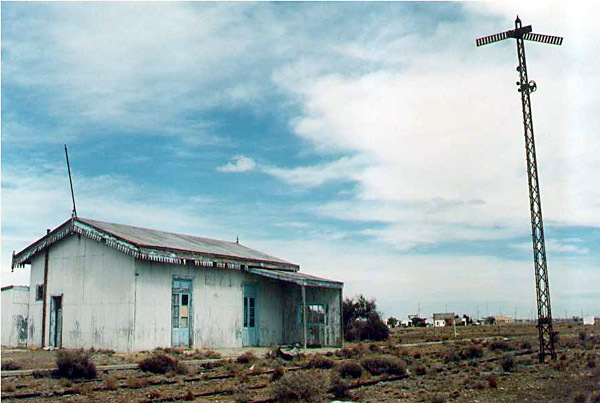 Fitz Roy station.The station building is inhabited as a private house. 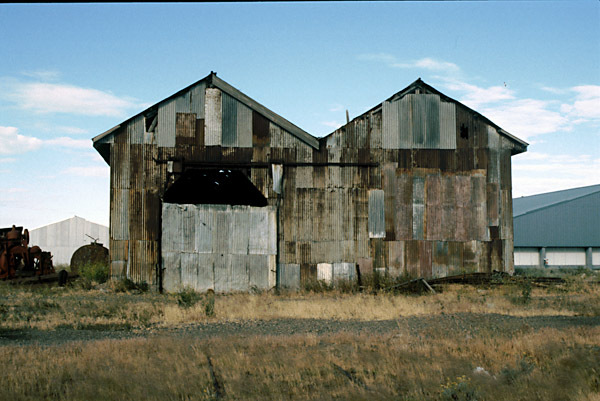 A back view of the same building. A rail rolled by Messrs Cammell in Sheffield in 1884. 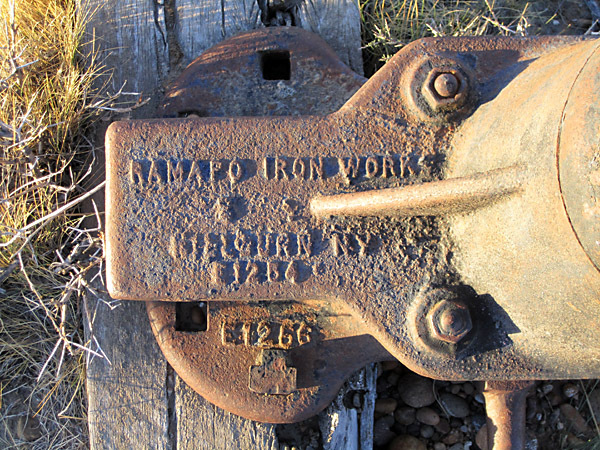 A casting by the Ramapo Ironworks of New York state USA, in this case the base of a points/switch lever stand. 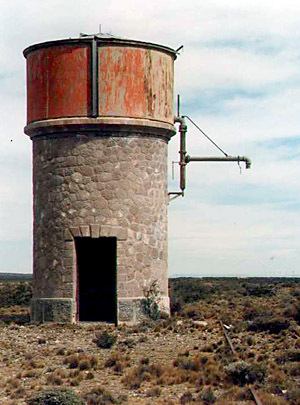 The photos below by Guillermo Bohrdt show two varieties of circular water tower along the line. There were also square tanks made up of 'Braithwaite' type panels, also on stone bases. 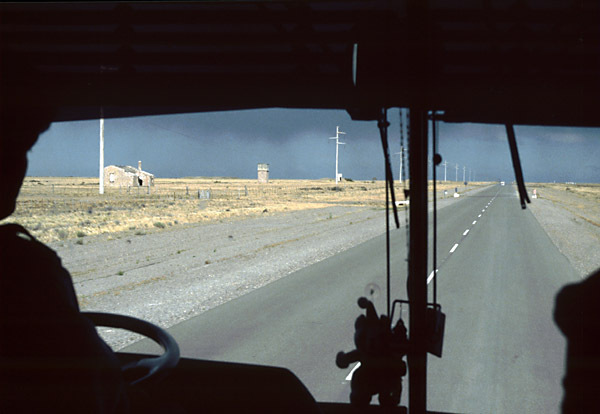 A bus passenger's view heading east towards Puerto Deseado. 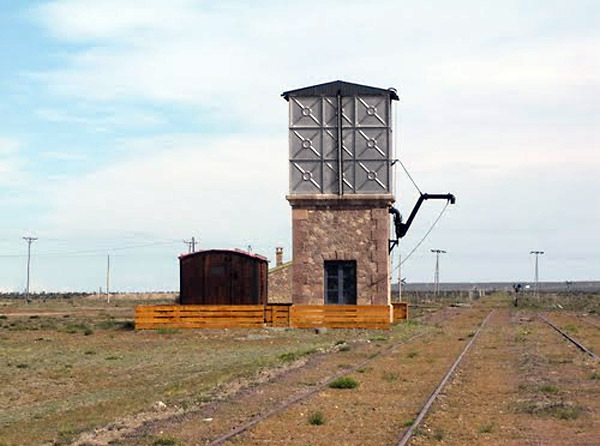 On the left a water tower and derelict station building can be seen - I think at either Antonio de Biedma or Pampa Alta. 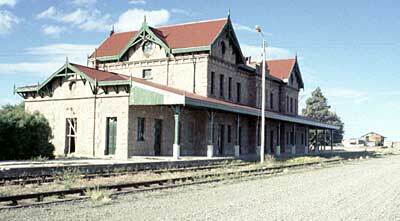 I n June 2014 the newspaper La Nación announced that a group of students on a course of investigation in Patagonian political geography were proposing to investigate the running of a tourist train from Puerto Deseado. They had secured from Ferrobaires two old postal vans and an electric locomotive. One of these coaches would be used for catering with a capacity of 14 passengers and the other non catering with a capacity of 20. The length of run would be 8-10 km at low speed due to the age of the track. Nothing more has been heard since then. 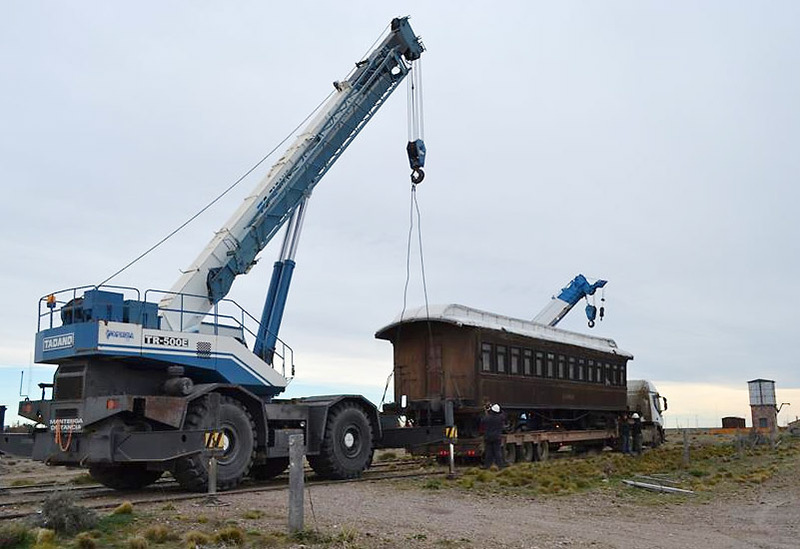 One winter's day, Sunday 22 June 2014, the first class coach, P111, from this line, which had been kept in Rawson since 1986, was returned to Jaramillo, where a museum about the FC Patagónico is being created. 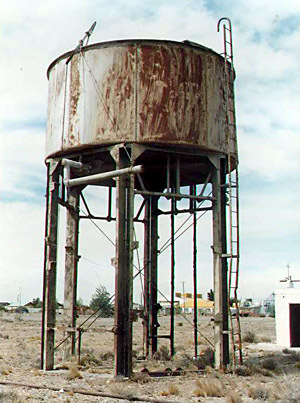 This is a fairly recent view of the water tank at Jaramillo. Despite its 40-odd years since abandonment it's looking good, thanks to its forming part of the intended museum development here. 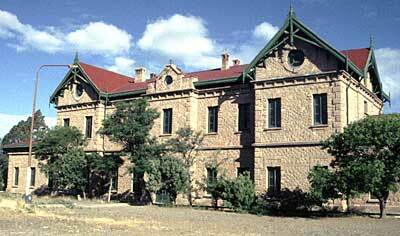 1 Photos kindly provided by the Fundación Museo Ferroviario in Buenos Aires. 2 Photos found in the railway museum at Puerto Deseado station, and reproduced by kind permission of the staff there.